Is this possible, or am I missing something obvious? It seems to me that the resulting signature (as seen in the signature preview) looks good, so why the problem? 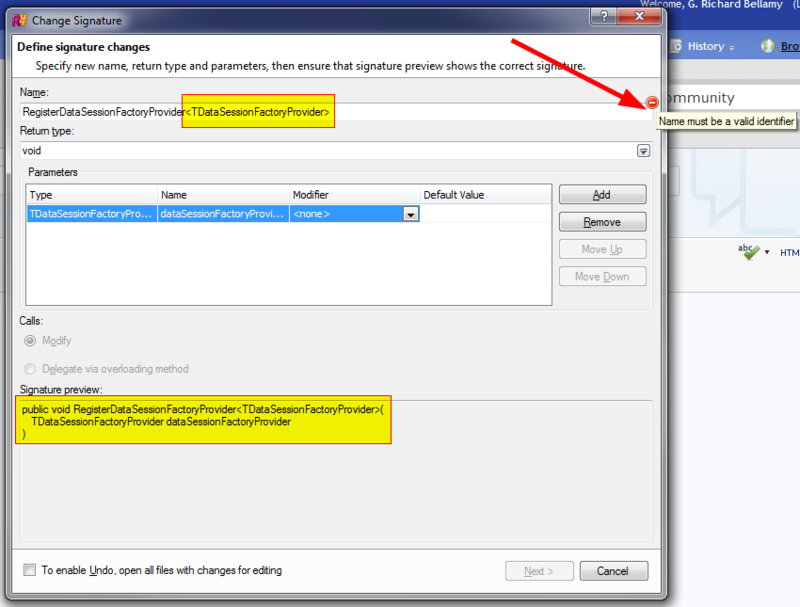 Change Signature refactoring doesn't support adding generic type parameters. from the 'Name' box to construct the preview. Thank you! good, so why the problem? I guess I was confused because the "Change Signature" DOES support generic method parameters. As well, it will change the signature of a Generic Method, as long as you don't want to change the generic type parameter of that Method. It would be an nice workaround to provide a "Delegate Method" refactor that was available in the "Refactor This" menu for Methods - much like the option during the "Change Signature," only stand-alone.